Muron now has not just one, but two, sets of stoplights! Our first! The big deep holes for the poles have been ready for months at the two major intersections in town. People here are used to unmarked open holes here and there but fortunately there were no major accidents that I know of. The lights were installed and turned on last Monday and accompanied by a policeman for one day blowing his whistle at nearly everyone who drove by. 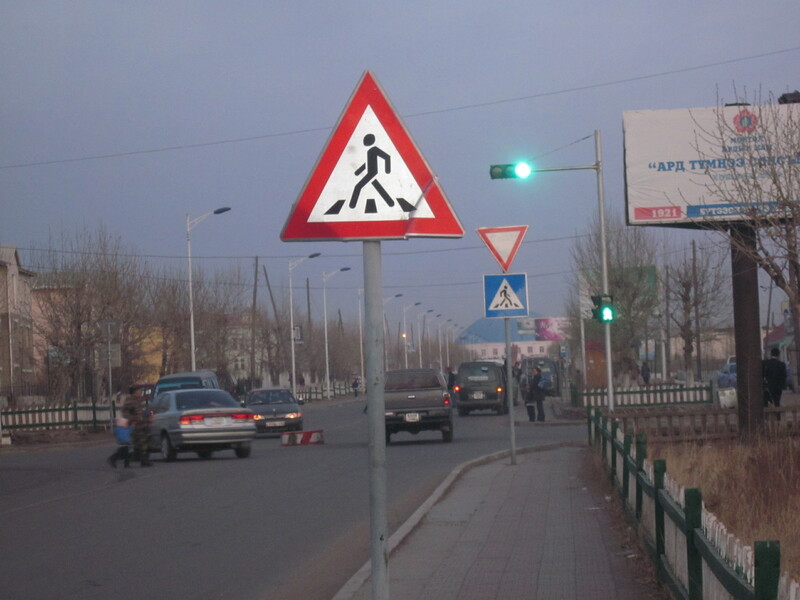 I’m sure most people have encountered lights in UB, but they still have caused quite a stir here—lots of frustrated honking. There are no left or right turn signals nor separate lanes and since the main intersection has lots of people turning left and right instead of going straight, it’s made for a fair amount of congestion. 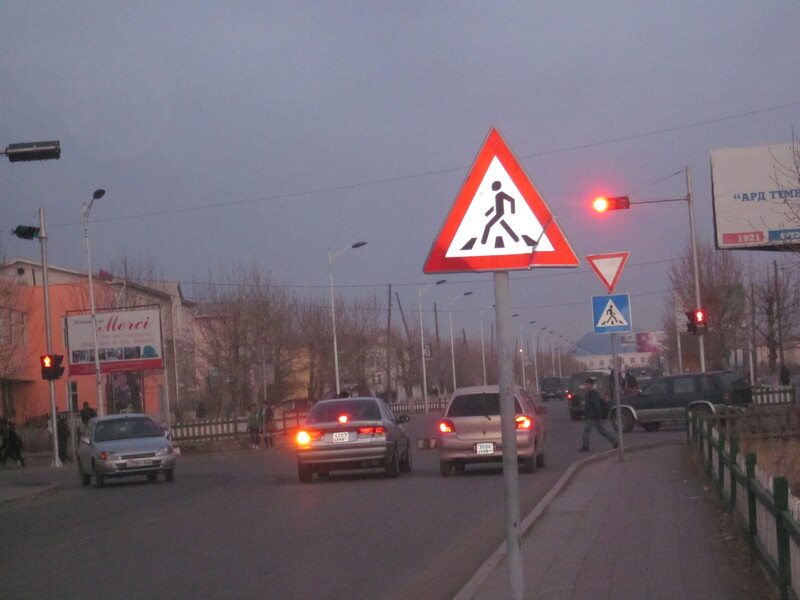 And then there are the pedestrians who are used to scampering out of the way of cars. Cars of course have the right of way here. But we’ll get used to it and I do think it will get better—and maybe prevent some fender benders or worse. Along with new stoplights, we have some new buildings going up—including two with colored reflective glass. I’d like to think they have something to with energy efficiency, but I’m not so sure. I keep asking, but nobody knows. 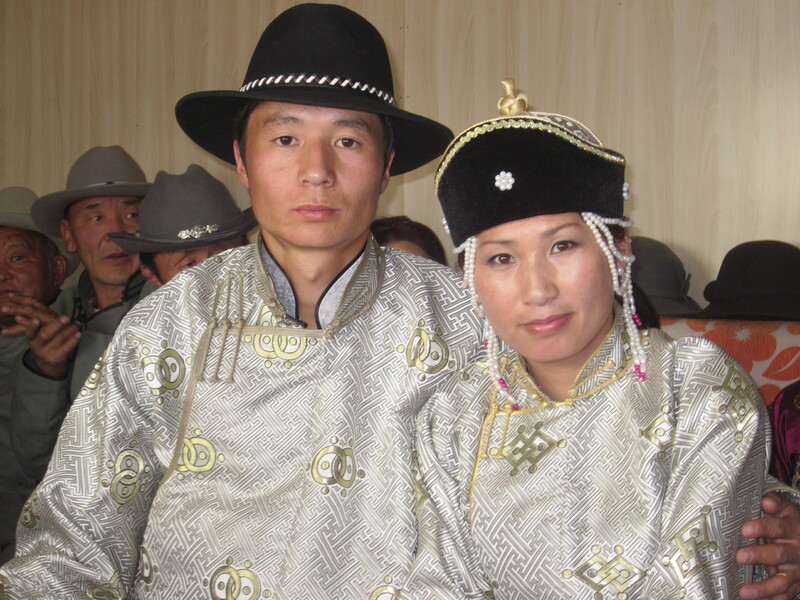 Last week I went to a wedding of a Mongolian friend. Her name is Enkhtuuvhshin. The wedding was held at her and her now-husband’s home here in Muron. According to the local Buddhist Lama, she was married on the most wedding-fortuitous day of the year, lots of weddings that day. There were about 70 people I think and the focus was on food, drink, some speeches by parents, some singing and much camaraderie. No formal ceremony. All the PCVs here know her and so we all went. The bride and family work very hard beforehand, making a lot of food and continually serving it as people come and go. And for days afterwards, the bride must continue to serve guests who drop who couldn’t come on the day itself. As in America, presents are essential and in return, each person receives a small gift of money along with a blue ceremonial scarf and a box of matches. 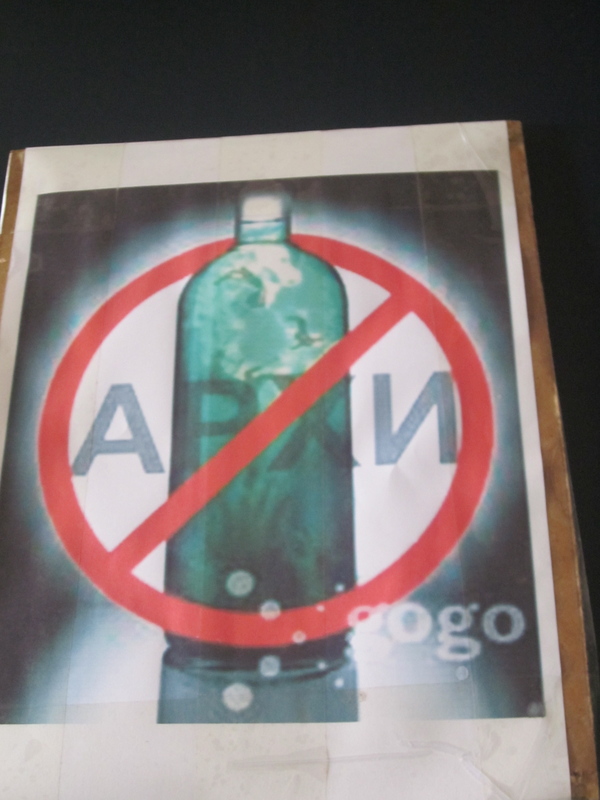 Word in the middle says "alcohol"
Last week was Alcohol Awareness Week sponsored by Peace Corps and its Volunteers. 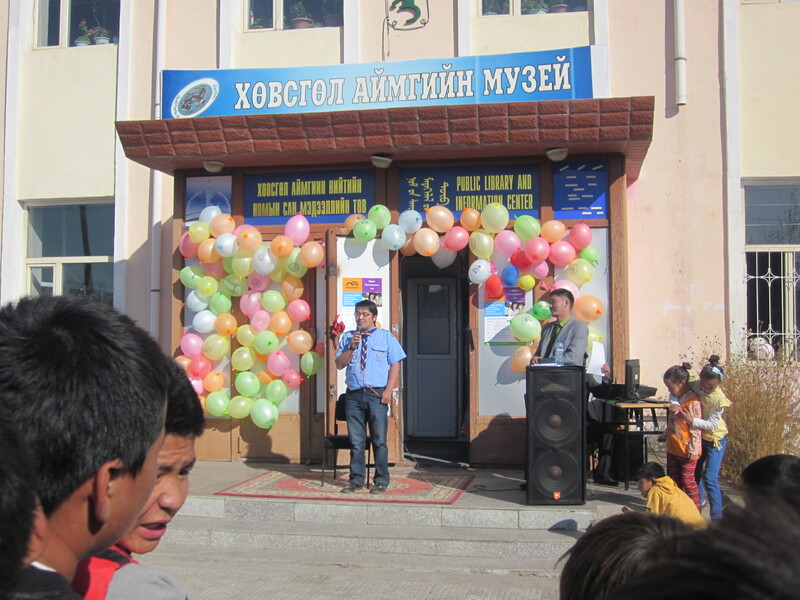 Focus is primarily on the young people with a number of events scheduled throughout the week, including poster contests, a parade with posters, teacher education, and a final event at the local theater complete with singing and dancing performances, a talk by a local former alcoholic, and skits prepared by the various schools with awards and prizes. For several months now, everywhere you turn, someone is sitting on a box with a big bag of pine nuts and several different size glasses sitting in front of them filled to the brim with the nuts. And everywhere you look, people have a hand to their mouth, putting a pine nut in their mouths, cracking it with their teeth and somehow extracting the tiny, tiny kernel and spitting out the shell. The ground is covered with pine nut shells. I think you have to be born with the skill—I can’t seem to separate the shell from the nut and end up spitting out everything. Still, I admire the people who gather and sell the nuts—putting out their wares in early morning (and now it’s freezing in the early morning!) and still there when I head home in the evening. 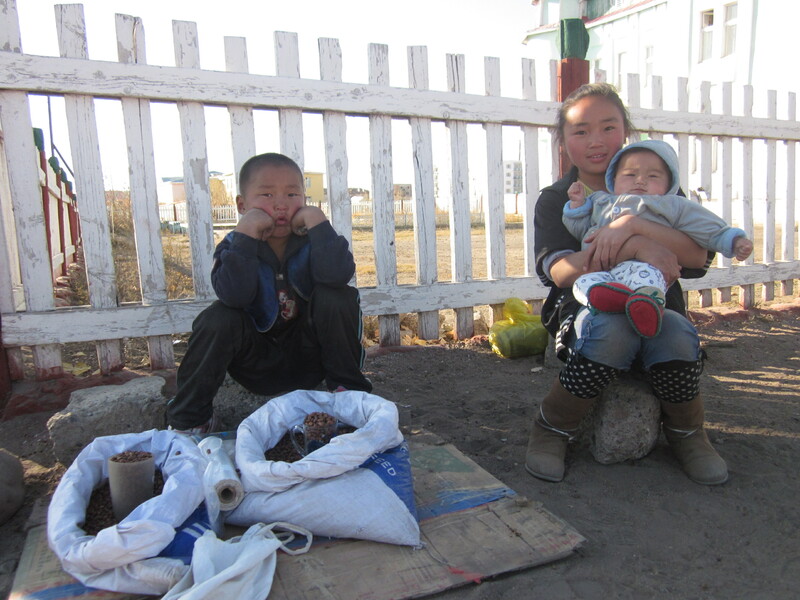 Mostly women do the selling, often two or three in a row, but near my home, a little boy is often on duty at a busy corner by himself, sometimes accompanied by a big sister minding a little toddler. I bought a small glass of his nuts and then took the picture—later gave the nuts away. I now have a pretty good supply of wood stored in a little anteroom in my home thanks to two of my fellow PCVs and to some local students. First, two PCVs came by one Saturday and split some of my firewood for me. And a couple of weeks later, a local teacher showed up with about seven teenagers from his class and split some more. The teacher made it a lesson in the importance of helping others. I made a good hearty soup for them with bread, fruit, and a local favorite of Choco-pies for dessert. They spent a couple of hours chopping away and even bringing it inside for me. My only concern is that they were so enthusiastic about splitting the wood, a lot of it is smaller than I’d like—will burn up a little too fast. I still have more wood in my woodpile so when I need it again, I’ll ask for someone to leave the pieces a little bigger so they will last longer. I make a fire when I get up in the morning (it’s the hardest part of the day now to get out of bed in the cold) and again when I get home in the evening. My little stove needs to be fed regularly to keep it warm enough in the room I live in in my little house and even then I wear 3 or 4 layers. But I’m accustomed to it and it’s not a hardship—I can build a fire really fast now! Hope you are keeping comfortable wherever you are. 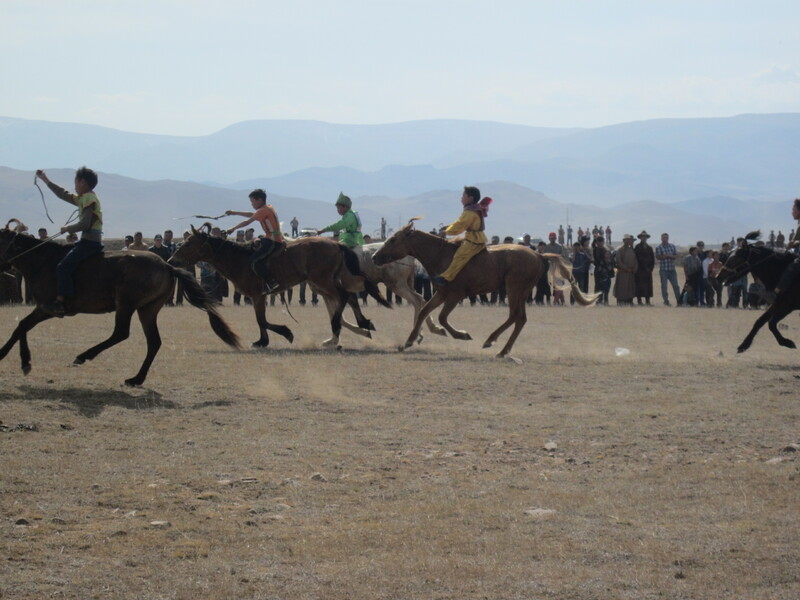 Naadam is the big summer holiday in Mongolia celebrating the three manly sports: horse racing, wresting Mongolian style, and archery. I live in Muron, the aimag center (like the state capital) and so our Naadam is always for the whole state of Khuvsgul. 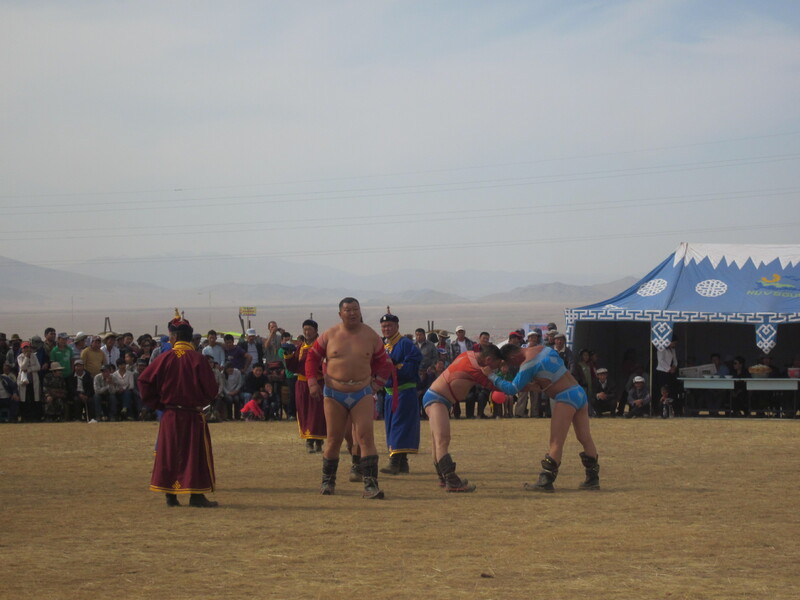 This year Muron wanted its own city Naadam just like the rest of the other towns have in the aimag. Even though school had already started, at the end of September we had 3 days of celebration. I spent the last day with a friend watching the horse racing, the wrestling, and the presentation of awards (always a big deal). I am always impressed watching the horses with their small riders come flying in from 10-17 miles away—many without saddles and riding as if glued to the animal’s back. There are different races for ages of horses from 2 to 7. An interesting sidebar: The horse that finishes last in the Daaga race (two-year-old horses’ race) is called bayan khodood (meaning “full stomach”—don’t ask why). And along with songs sung to the winners, a song is sung to the bayan khodood wishing him luck to be next year’s winner. As I say, Mongolians love to celebrate. 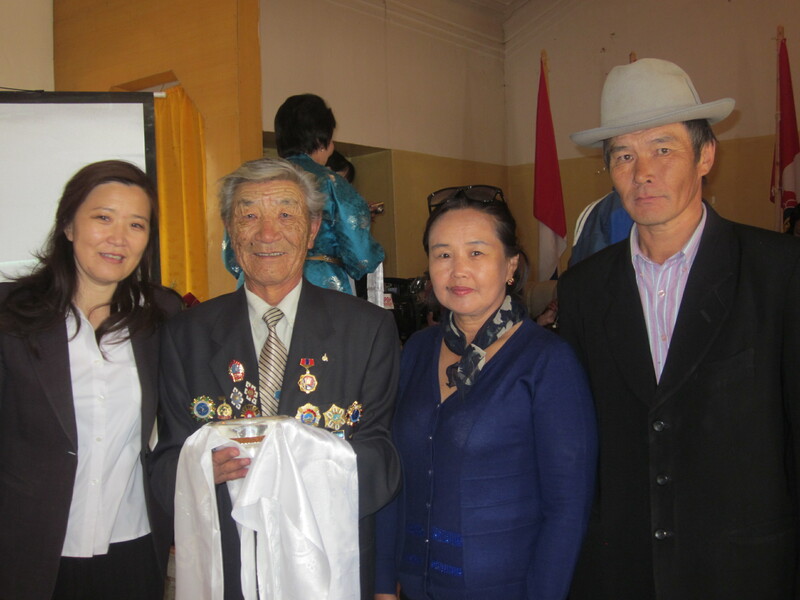 Last week, my boss’s father (Jamsren) was honored along with three other men at a special ceremony complete with medals, plaques, speeches, music and of course a sip of vodka for all. About 100 people were present. I was the official photographer for Janscren and am posting a family photo. I also witnessed the arrival of 15,000 English books for the local library, courtesy of Bookbridge (see www.bookbridge.org for details). A joint effort of Kuehne + Nagel, www.kn-portal.com/ and the Bookbridge team, the group spent months preparing for this effort which also includes a provision for teaching English and many activities for children. A team of 12 spent a week setting up shelves, painting, sorting the books (all donated—most from America) and then, of course, had a grand opening with balloons and music performances and speeches. One of our ongoing activities will now take place in the library instead of the local hotel. It’s called English Corner (Mondays, 7 to 7 pm) and anyone is welcome to come who wants to practice speaking English. Last Monday I talked with a small group of adults about proverbs such as “too many cooks spoil the broth”. I have long been interested in Mongolian proverbs and when I was in UB a while ago I found a book filled with Mongolian proverbs in English and Mongolian, along with an explanation of their meanings and even their frequency of use. I might compare that to the English “You can’t tell a book by its cover.” I have a list of English proverbs too and we are having a good time discussing and comparing them. 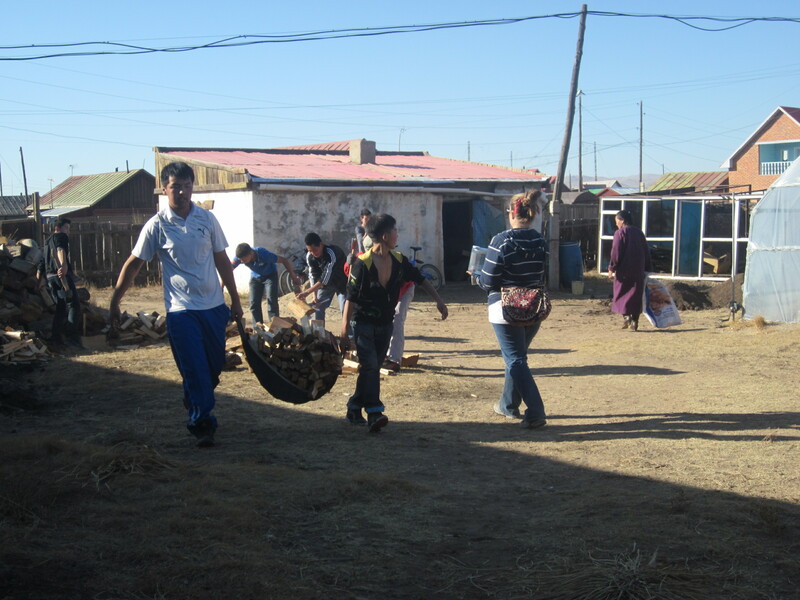 Mongolian proverbs often include a reference to animals or to family members. What’s your favorite proverb? Do you have a favorite—is there one your mom or dad or grandparent always used? Send it to me, either by sending me a comment (click below on “send a comment”) or email me directly.